Artificial intelligence generated plenty of chatter amongst the pharma marketing intelligentsia in 2018. Will 2019 be the year when the industry fully embraces it as more than just a tactic? Leadership representing the 2018 Manny Award agency and network winners and finalists share their views on various healthcare industry trends and developments. Lions Health is a dedicated two-day event held annually within Cannes Lions in France. Lions Health is billed as the only place in the world to experience talks from leading pharmaceutical, healthcare, wellness, biotechnology and medical marketing practitioners. Event management says Lions Health is built to deliver the insights, ideas, tools and techniques that lead to life-changing outcomes. DTC Special Feature: Which color is it? A recent study of DTC advertising appearing in the Journal of General Internal Medicine concluded that few broadcast ads are compliant with FDA’s guidelines. The reality, though, might not be so cut and dried. Let’s have a peek in the crystal ball 10 years into the future. What will agencies look like then? What will the marketplace look like? 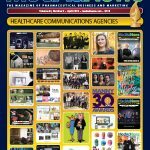 2017 was a very good year for many of the agencies profiled in this annual directory featuring the leading healthcare communications agencies. Some reported individual setbacks, but they were still able to overcome these. As a wave of new drugs and biologics hit the market, several of the top healthcare agencies supported their launches. As more innovative – yet even more expensive – therapies enter the U.S. market, brand marketers will have to find equally new and innovative ways to prove the value of their medicines to payers and patients, especially as insurance plans continue to put more of the cost burden on patients. A combination of regulatory conditions, shifts in physician workplace demographics, and an increased reliance of highly specialized sales personnel has steadily eroded the traditional sales reps’ responsibilities and ability to manage the HCP practice relationship as a true SPOC. Television as a marketing medium seems so, well, 1950s these days. Given the ubiquity of digital and mobile devices and the tracking and targeting opportunities they present, not to mention the lesser cost attached, blasting TV spots out to whomever might be watching could strike the uninformed as old-fashioned. But pharma’s top brand managers clearly don’t think so. Med Ad News asked industry experts what they thought DTC communications might look like in five years. This is what they told us. A listing of the top prescription brands by 2016 DTC spend according to Nielsen data. A listing of the top prescription brands by DTC spend in 2016 according to Kantar Media data. A listing of the top companies by total DTC spend in 2016 according to Nielsen data. A listing of the top brands by DTC television spend in 2016 according to iSpot.tv data. The U.S. FDA has allowed marketing of 23andMe Personal Genome Service Genetic Health Risk tests for 10 diseases or conditions.